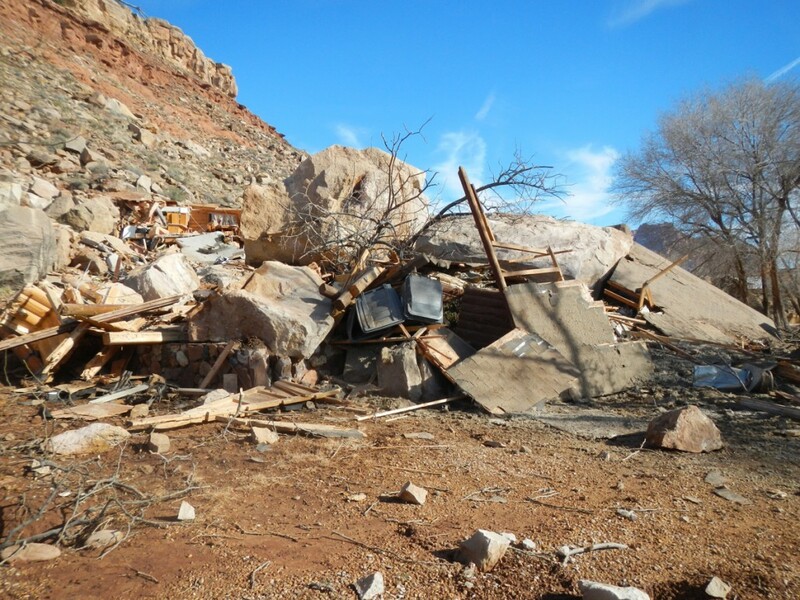 December 12, 2013, fatal rockfall in Rockville, Utah. Two people perished when their house was struck by the rockfall. 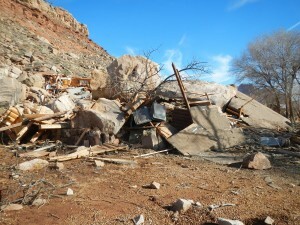 Geologic processes damage homes in Utah every year and endanger lives. Therefore, it is prudent to identify and understand the potential geologic hazards that exist when buying, building, or selling a home. Earthquake-related hazards include ground shaking, fault rupture at the surface, liquefaction, and earthquake-induced landslides and flooding. Slope failure, such as landslide, debris flow, and rock fall. 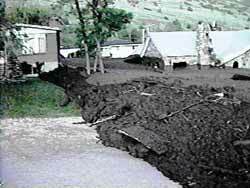 Problem soil conditions, such as expansive and collapsible soils, ground cracks and fissures, and land subsidence. Flooding in floodplains, such as from rising streams, lakes, and shallow groundwater. Radon is a radioactive gas that is produced from the natural decay of uranium. Be aware of and learn more about the various geologic hazards in Utah. The Natural Resources Map & Bookstore has numerous publications on geologic hazards. Additional sources of hazards information are available at Earthquakes & Geologic Hazards, Hazard Assistance, and suggested reading below. For homebuyers and homeowners, conduct geologic-hazards research for your area. Look at maps of potential geologic hazards. Many of these are available online at Geologic Hazard Maps. These include statewide maps of problem soils, shallow ground water, flood hazards from lakes, landslides, and radon-hazard potential and county-sized maps of ground-shaking potential, earthquake faults and fault zones, liquefaction potential, radon-hazard potential, site response, and hazard map folios. Note that these maps are not sufficiently detailed for house or lot-size hazard evaluations but are useful for indicating potential hazards that could exist for a neighborhood or subdivision-sized land parcel. The UGS also produces geologic reports and publications describing the geologic hazards for some specific areas. Find out if more site-specific maps are available from your local city or county government. The planning departments or permitting agencies in Salt Lake, Davis, Weber, and Utah Counties have hazard maps for their respective areas. Ask the local government for geologic-hazards reports. Find out if geologic-hazards ordinances have been adopted, which can vary widely among jurisdictions. Local governments differ as to what hazards information they have, as well as the way they define and evaluate geologic hazards for building permitting and residential development. Find out if the location is in a special-study area (a zone of investigation where specified geologic hazards are highly probable), such as a fault-rupture special-study area. This information can be obtained by contacting your local city or county planning or building permitting agency. Check to see if your house is located in a federally designated special flood hazard area by going to the Federal Emergency Management Agency (FEMA) and obtaining a Flood Insurance Rate Map (FIRM) for your area. Lenders may require homebuyers to purchase flood insurance in high-risk areas prior to the purchase of a home. A wise homebuyer should find out as much information as possible before making decisions. It is also the potential homebuyer’s responsibility – Utah state law does not require realtors to verify or disclose geologic hazards. Do not assume that local government approval of a subdivision or building permit guarantees safety from geologic hazards. 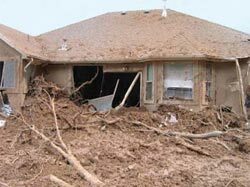 Losses due to geologic hazards are normally not covered by basic homeowner’s insurance policies. For a summary of earthquake insurance in Utah go to the Utah Insurance Department. Flood insurance is recommended if you live in a floodplain. You can significantly increase safety at home by following a few simple steps. For earthquake safety and preparedness information go to Be Ready Utah. After a large earthquake, utilities and emergency services will likely be delayed. A household should be prepared for 72 to 96 hours of self-sufficiency after a major earthquake. Structural failure of homes is one of the most dangerous outcomes of an earthquake. Older houses were not subject to the same building ordinances and seismic building codes as today, and therefore are more at risk than newer houses. In Utah, seismic codes for building construction began in the mid-1970s. However, much can be done to reduce damage to older houses. Studies have shown that seismically retrofitted homes are significantly more resistant to earthquake-related damage than identical homes that are not retrofitted. Costs vary, but complete retrofits are typically 1-3% of the cost of a home. Utah State History (Historic Preservation) offers an introduction to seismic retrofitting in “Bracing for the Big One“. The Utah Guide for the Seismic Improvement of Unreinforced Masonry Dwellings 2015 (pdf) shows different approaches to retrofitting different types of older homes. An awareness of geologic hazards allows for you to provide accurate information to your clients, effectively answer client questions, earn client trust, and provide clients with a better service. Studies have established that geologic disclosure does not adversely affect sales of homes. 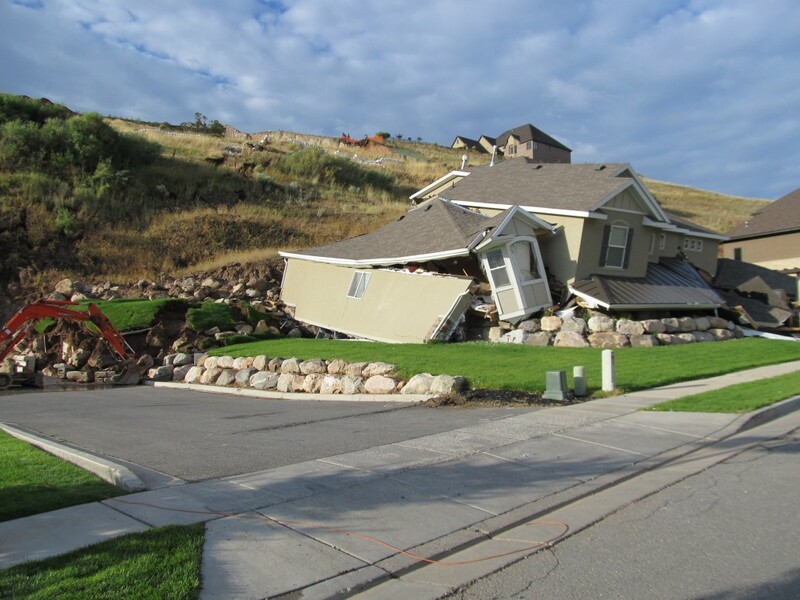 Geologic hazards awareness also allows the homebuyer the opportunity to protect their property through insurance, retrofitting, and other risk-reduction measures. Review any geotechnical reports that are available for the lot, subdivision, or neighborhood. If building on an undeveloped lot, legislation requires that steps need to be taken if the location is in a special-study area. For example, if the location is in a fault-rupture or expansive soil special study area then an investigation needs to be conducted by geotechnical engineers. For Salt Lake County see Minimum Standards for Surface Fault Rupture Hazards Study (pdf). In most cases, threats from geologic processes can be greatly reduced through proper building placement or construction techniques. Be familiar with the fundamentals of seismically retrofitting older homes (homes built prior to 1975) and be able to identify seismic flaws in homes. For example, in California, seismic structural deficiencies that must be disclosed on the transfer of residential dwellings include 1) absence of foundation anchor bolts, 2) perimeter cripple walls not braced, 3) first-story walls not braced, 4) unreinforced masonry perimeter foundation, 5) unreinforced masonry dwelling walls, 5) habitable room(s) above a garage, and 6) water heater not anchored, strapped, or braced, or has rigid connections (home inspectors on the Wasatch Front will typically acknowledge this last deficiency). Correction of these six deficiencies greatly minimizes damage to homes and consequently increases safety.